About 5 kilometers ahead of Kundal Shahi, Salkhala is another secluded spot of tourist interest located across river Neelum. Here a trout hatchery has been established by AJK Fisheries Department. A Tourist Rest House and 3 huts are available here for accommodation. Athmaqam is 10 kilometers from Kundal Shahi. It is located at a height of 1371 meters ASL. Being the districts headquarter of Neelum District, it serves as a take-off point for tourists interested in hiking and exploring the inner valley. It is an attractive place known for its variety of fruit. All necessary facilities viz bazaar, post office, banks, hospital, telephone and PWD rest house are available here. Upper Neelum (Neelum Village) is located at a distance of about two & a half kms from Keran. This panoramic lush green village, profound in wild fruit and wildlife, attracts the tourists from every nook & corner of the country. Another remarkable feature of this spot is that one can view the entire area of occupied Kashmir from here. 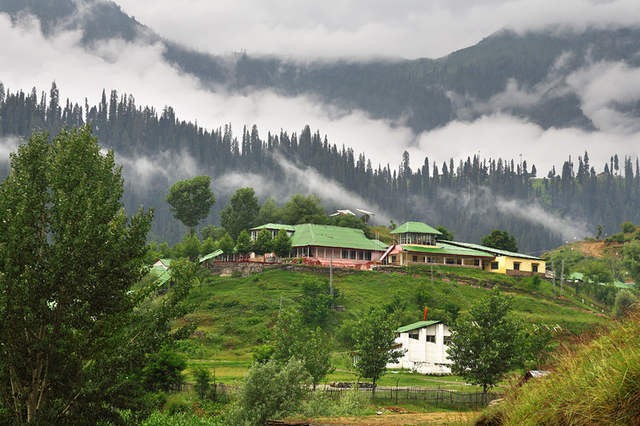 Owing to its tourist attraction AJK Tourism Department has launched a development project to convert both the Upper & Lower Neelum in to a Tourist Resort. Dear Sir! I want to visit Neelum valley, I am a professor in Cadet College, Hasan abdal. Being a professor I could not afford a costly tour, Please arrange arrange a low cost tour of the valley. My family will be alongwith me. Me, my wife, son 13 yrd and daughter 7 years. I want to visit for a week. during 11th june to 23rd june 2011. I’ll be thankful to you for your this act of kindness. & theme. Did you make this website yourself or did you hire someone to do it for you?